What stimulates the artistic mind to pick up a brush and create a painting, or to produce a beautiful object, or, for that matter, to write a compelling novel? Sometimes we see something that triggers our imagination – whether it’s a beautiful landscape, a bowl of perfect fruit, colors that turn us on, or a story that we’ve overheard. Some artists use many of these stimuli to create their work. Painters can tell the story of what they’ve been thinking about through narrative art. These storytellers don’t use words; they use images and color to inform the viewer. Ka Fisher’s paintings, which have a lovely, Impressionist style, tell stories about Native Americans – their land and the things they do during their daily lives. She told me that she often visits places like Chinle, Kayenta and Canyon de Chelly for her inspiration. At the Hubbell Trading post, she has taken a “listening tour,” where she overhears conversations among customers. “I get many ideas from the people I meet as well as places I visit,” Ka said. “In the Town of Tubac, they have open wood structures that are used for events to give shade. 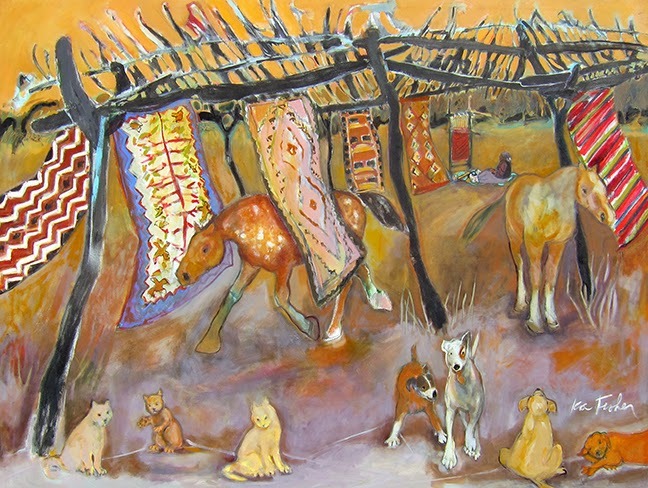 They also have the same type of structures on the Navajo reservation.” Ka took this vision and developed a story in her large painting entitled “Airing Out,” where rugs are hung to air, and horses walk between them. “I wanted the narrative to be happy and fun, so I added many animals in the foreground,” she said. 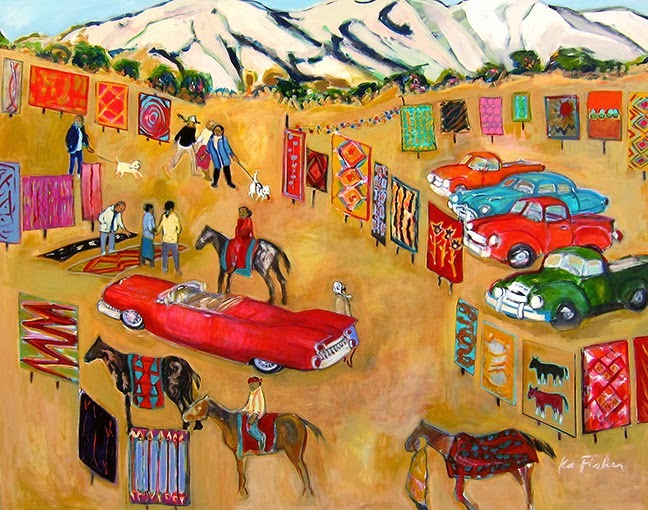 Another painting, “Dreamboat Annie Cruisin’,” combines stories that relate to the Navajo way of life and Ka’s own history. “Here, I’m mixing memory and imagery,” she said. “The vintage cars are embedded in my mind from childhood.” Ka sets the scene in the mountain foothills, where Navajo display their rugs in and among a vintage car show. That may not actually have happened, but it’s Ka’s story to tell! The bright colors of the rugs and the cars create a lively, appealing scene. Sometimes memories can play a role in narrative painting. In Ka Fisher’s case, she spent her childhood summers in Canada by a river near two Indian villages. The scenes she paints incorporate some of that landscape, along with the Southwest she has adopted as her current home. Over in California, artist Linda Carter Holman tells painted stories about her vision of life. 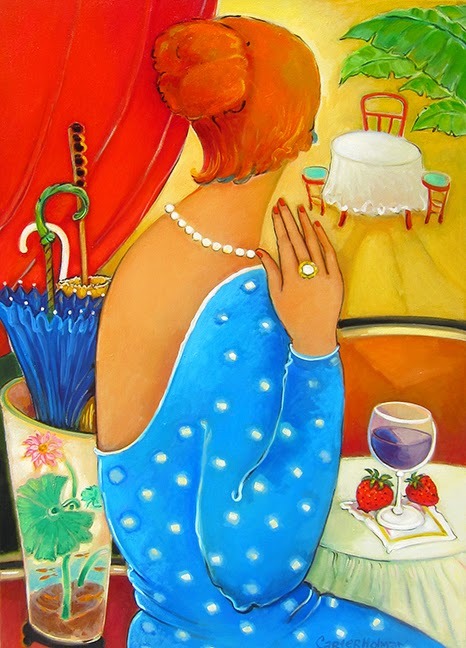 Many of the elements in her paintings have special meanings for her. 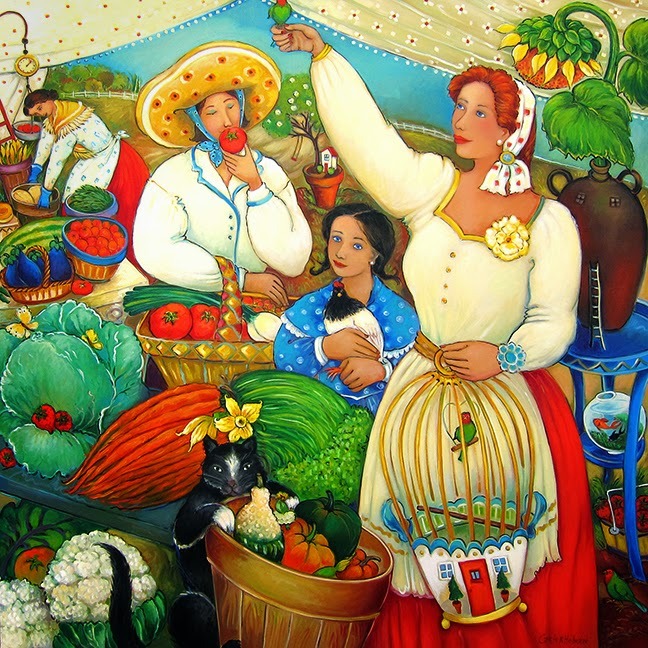 In her painting entitled “My Market,” she created a scene that’s “how it would be if I had a market.” She said that the sunflower over one woman’s head is symbolic of the sun, which she couldn’t show because of the awning overhead. The lovebird in the cage is another favorite image, as is the goldfish in the bowl under the table on the right side. “Goldfish represent the miracle of discovering the world to me,” she said. Above the goldfish bowl, there is a jug with a small ladder leaning against it. Linda said that image also tells a story of self-discovery. After speaking with these two artists, I started thinking about my own paintings. Do I tell a story, too? 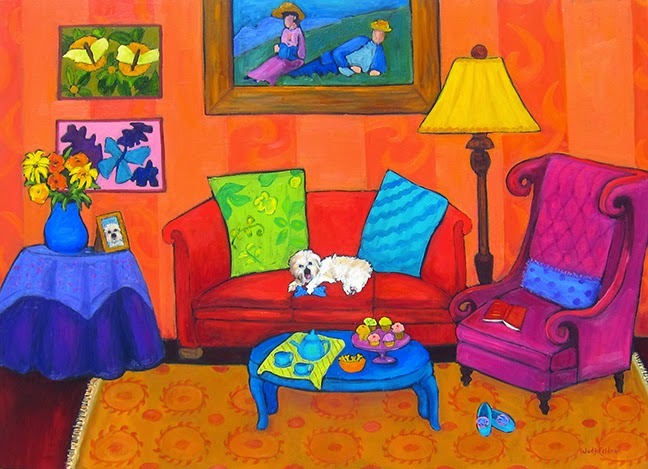 I actually think I do, since many of my paintings are about places I’d like to be – cozy settings, with colorful furniture, and, usually, a contented dog. “Treats” is a good example of a typical story I tell. The open book, the slippers and the tea and cupcakes all indicate that a person will soon be coming back into the room. The dog shares its owner’s good life, with treats for him on the table. 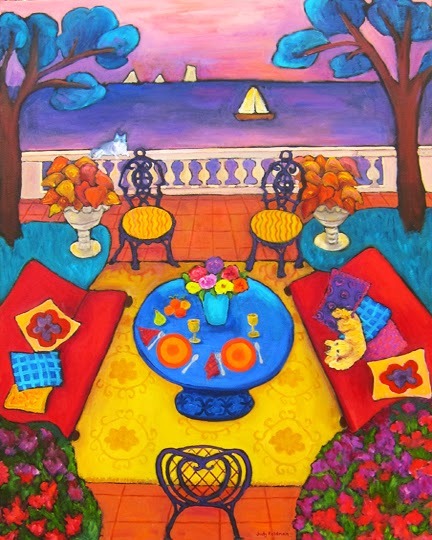 Another painting, “Afternoon at the Cote D’Azur,” is inspired by a visit to the South of France. Here, again, my story is of an inviting place, with a table set for a possible romantic dinner, observed by the family’s dog and cat. We all have stories. Some of us are fortunate to be able to tell them visually. But, even if you can’t paint or write, it’s important to share your stories with others. And, don’t forget to embellish them a little! You can see more art by Judy Feldman, Linda Carter Holman and Ka Fisher at Wilde Meyer Gallery.